K’JIPUKTUK (HALIFAX) - An alliance of twenty Atlantic Canadian and Quebec environmental, Indigenous, and fishery organizations gathered today to express alarm that offshore petroleum boards would be given more power over oceans off Nova Scotia, Newfoundland and Labrador, and in the Gulf of St. Lawrence under the Liberal government’s plan to modify the Canadian Environmental Assessment Act. “The Trudeau government promised to make environmental assessment credible again,” says Gretchen Fitzgerald, National Program Director of Sierra Club Canada Foundation. “Sadly, if the proposed legislation is passed, they will be doing the opposite. Currently, the federal government’s public consultation calls for an independent national environmental assessment agency (CEAA) with sole responsibility for Environmental Assessments. We support that recommendation”, she says. 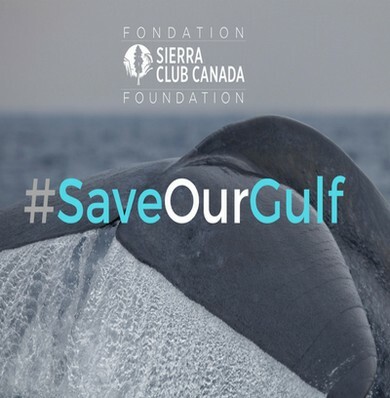 “What makes this even more ridiculous is that the Department of Fisheries and Oceans manages the Gulf’s five provincial fisheries from a Gulf-wide point of view,” says Greg Egilsson, Chair of the Gulf Nova Scotia Herring Federation. “More and more scientific evidence is coming to light that seismic airgun surveys that precede oil exploration and are to detect oil reservoirs below the sea floor have a pervasive, widespread impact on the entire ecosystem, from plankton, through fish, lobsters, crab and scallops, right up to whales,” says Dr. Linda Weilgart, who is an international expert on the impacts of seismic on marine mammals. “These Boards have shown themselves to be environmentally irresponsible in permitting seismic surveys in endangered North Atlantic right whale, Northern bottlenose whale and blue whale habitat. It is clear these boards are woefully inadequate and ill-equipped to protect our marine life,” she says. “Mi’kmaq leaders have been calling for a moratorium on oil drilling in the Gulf of St Lawrence for several years now,” according to Dorene Bernard, Mi’kmaq Elder and Water Protector. “Why is the federal government not upholding Indigenous rights? Our waters are sacred. We need to ensure we uphold our responsibilities to protect and keep them healthy. Water is more precious than oil.” she says.